People like to enjoy a nice refreshing drink when the days are long and the nights are warm, which is why many people turn to ice. Ice production is a highly necessary part of any business, restaurant, or bar. If you are looking to invest in a low-cost, high-quality ice machine, we suggest you consider the Scotsman ice maker. What Is The Scotsman AC 46 Ice Maker? 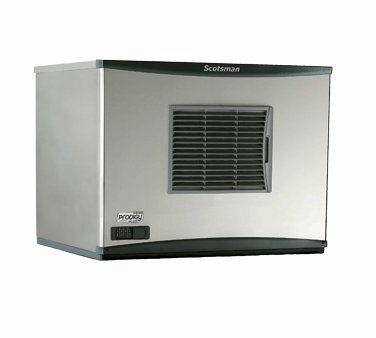 The Scotsman ice maker is a self-contained ice machine that is made of grade 304 stainless steel. This ice maker creates cube ice and can be customized to use either a water cooling system or an air cooling system to fit your company's needs. Standing in at only about 25 inches tall, this small Scotsman ice maker is able to create about 52 pounds of ice per day, which is approximately 1200 cubes. The machine itself is also lightweight and easy to transport. The price of the Scotsman ice maker will depend on where and when you buy it. 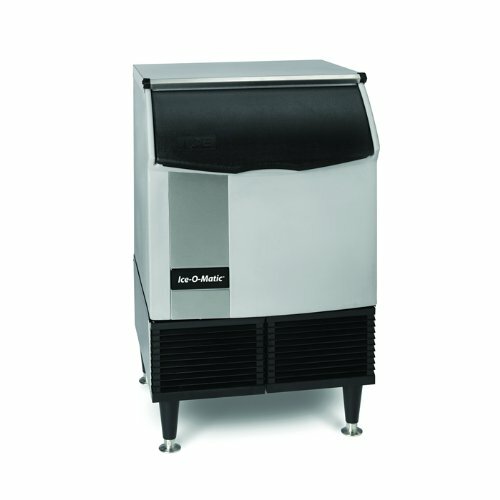 If you go to an online seller like barstuff.com, you could get this ice maker for around $2,100. The price of the Scotsman ice maker will depend on where and when you buy it. We listed an approximate cost for comparison's sake, which we find to be consistent on barstuff.com's marketplace. Even though this machine is small, it works hard. In a single day, the Scotsman ice maker produces roughly 52 pounds of ice. It can also store about 20 pounds of ice in its storage bin at any time. This makes keeping up with your business’s ice demand simple. You can also choose whether you want the cooling system to be run on water or air, which allows you to install the method that would be best suit your function and budget needs. There is not a lot to do when it comes to assembling the Scotsman ice maker. Most of the machine comes pre-assembled. All you should have to do is hook up your cooling system and plug the ice machine in. If you did happen to run into any trouble, there is a manual available. The best aspect of the Scotsman ice maker is its size; its small volume means the machine can easily fit any space you want it to. It can tuck into an office, under a counter, or in the corner of a room. It is made with grade 304 stainless steel, which helps to keep it safe and sanitary. Unfortunately, there does not appear to be any warranty on this specific Scotsman ice maker. Some of the ice makers have model specific warranties, but the Scotsman AC 46 ice maker is not covered by the manufacturer. Depending on where you purchase this product from, you may be able to get some coverage from the dealer. 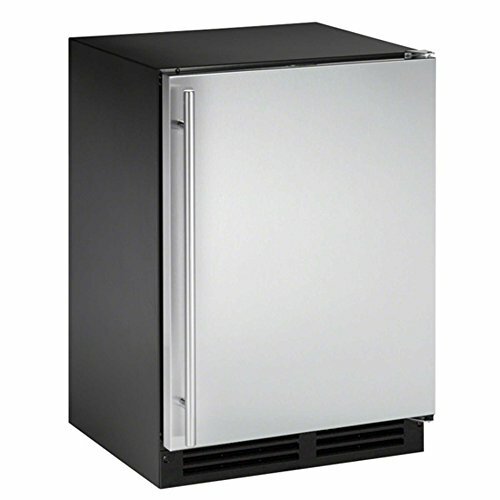 The U-Line (CLRCO2175S-01) - 2000 Series 24” clear ice refrigerator-ice machine is a combination machine of both an ice maker and a refrigerator. With a stylish, inconspicuous design, this ice maker is truly a top-of-the-line piece. The U-Line refrigerator-ice machine can be purchased on Amazon for around $7,850. This price may fluctuate depending on where and when you purchase it. In order to get the best deal, be sure to check all possible listings prior to purchase. This ice machine has a unique refrigerator section. Alongside the ice maker proper, the U-Line machine has a cooling section appropriate for food and beverages. This makes storing the components for your drinks, small snacks, or other materials easy. You can have your ice and your refrigerated goods in one place. The refrigeration area comes with three glass shelves that allow you to store a decent amount of things inside. However, the ice making portion of this machine is a little lacking. The ice machine section is only able to hold about 15 pounds of ice at any time, which is somewhat less than its competitors. It also can only create up to 40 pounds of ice per day. If you are looking for a machine that can consistently supply large amounts of ice, this may not be the ice maker for you. There is not a lot of assembly required for this ice machine, but if you had any questions, there is a manual available. The versatility of this ice machine is a double-edged sword. On the one hand, having an ice maker and refrigerator combination is great. It allows you to do more things at once and allows you to save space. On the other hand, this is not the type of ice machine you want if you are running a big business. 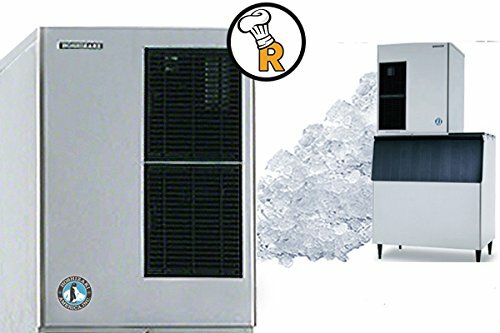 The refrigerator components mean the ice machine cannot hold a lot of ice or produce the same quantities of ice its competitors can. If you do not need tons of ice daily and enjoy having a multipurpose appliance, then this is the perfect fit for you. U-Line does not appear to offer any warranty on the U-Line (CLRCO2175S-01) - 2000 Series 24” clear ice refrigerator-ice machine. Depending on where you purchase it from, you may be able to obtain some coverage from the dealer. If you need a high quality ice machine with the ability to hold a lot of ice and fit under your counter, check out the Ice-O-Matic ICEU220FW Ice Series cube ice maker. From the high-quality Ice-O-Matic brand comes a well-crafted ice machine able of producing over 250 pounds of ice per day. The price of the Ice-O-Matic ICEU220FW Ice Series cube ice maker may fluctuate a bit depending on where and when you purchase it. In order to make sure you are getting the best price, be sure to check all possible listing prior to purchase. The Ice-O-Matic ice maker is small enough to fit under a counter which makes this a great appliance for tight places. If you wanted to place this at your bar, you could give your employees easy access to the ice while keeping counter space free by sliding it under your countertop. It can also store up to 70 pounds of ice at any given time. This can help ensure that your guests and workers always have plenty of ice on hand. There is not a lot of assembly required for this ice machine. That being said, it is heavy and may take a few people to move it. Once it is in place and all set up, you should be able to produce tons of ice in no time. If you have questions, there is a manual available. A unique thing about this ice maker is that it is ENERGY STAR certified. This means that this specific unit uses less energy than similar ice machines. In the long run that could save you a lot of money in operating costs. Plus, this ice machine is made with stainless steel which will help to keep the machine safe from corrosion. The interior of the ice machine is also antimicrobial-coated, which means your ice machine will be protected from unwanted bacteria growth on the inside of your machine. The Ice-O-Matic ICEU220FW Ice Series cube ice maker comes with a five-year parts coverage warranty for your compressor and evaporator. If you purchase the Ice-O-Matic water filter with your ice maker and keep up with the maintenance by replacing the filter every six months, you will receive a seven-year parts and labor warranty on your evaporator. If you need a lot of flake ice very quickly, you will want to invest in the Hoshizaki Commercial Ice Machine Model F-1500Mwh. This ice machine can produce over 1,500 pounds of flake ice per day. Plus, its convenient size and style make it easy to store in plain sight. If you purchase the Hoshizaki Commercial Ice Machine Model F-1500Mwh on Amazon, you can get it for around $7,180. The price for this product may fluctuate depending on where and when you buy it. If you want to make sure you get the best deal, be sure to check all possible listings prior to purchase. This ice machine is not only strong, but smart. The Hoshizaki Commercial Ice Machine Model F-1500Mwh has an automatic cleaning system called Clean Cycle. The ice machine will do an automatic self-clean every 12 hours to get rid of any sediment that may be in the ice and to help make the machine last longer. These cleaning cycles last approximately 15 minutes and can be manually controlled so you can fit the cycle into your daily work flow. This ice machine has little assembly, but it is important to note that this machine is not light. It will take time to carefully position this product in your home, office, or business. If you have any questions or concerns about the product while setting it up, there is a manual available for reference. This ice maker is made of high-quality stainless steel to ensure that corrosion will not affect the quality of the machine over time. It is a bit unclear just how much ice you would be able to store in its storage bin, but it does not appear to be a lot. Since this ice maker can produce over 1,500 pounds of ice per day, you may want to consider getting an additional storage bin. That being said, the flake ice it makes is of a high quality and comes out very quickly. Hoshizaki provides a three-year warranty for parts and labor of your entire ice machine. It also provides a five-year warranty on the parts for the compressor. Overall, the Scotsman ice maker receives a rating of 4 stars. It is able to produce a decent amount of ice for its size -a mid-range amount when compared to similar models- and can hold roughly 20 pounds of ice at any time. It is reasonably priced and made with high-quality craftsmanship. If you need something that produces hundreds of pounds of ice per day, consider one of the other products on this list. However, if you need a reasonable amount of ice at a decent price, the Scotsman ice maker is the perfect fit for you.